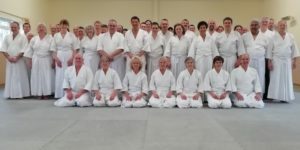 Members from all Ki Federation clubs are welcome to attend Headquarters Aikido classes. 6.15 – 7.00pm Sensei Sabine Foster. 7.10pm – 8.00pm Sensei Will Fearbunce. 8.00 - 9.00pm - Sensei Margaret. 12.30 - 1.20pm - Sensei Margaret.